Being in business for 40 years is no easy accomplishment. For the KoonsFuller law firm, determining how to celebrate their longevity was clear as day. KoonsFuller established the KoonsFuller Family Law Foundation, which granted a total of $200,000 to some of the charitable organizations with which they’ve worked during their nearly half-century of existence. “What better way after 40 years of success than to share that success with the people who work so hard?” says Ike Vanden Eykel, CEO and Managing Shareholder in the firm’s Dallas office. The firm operates five full-service locations including Dallas, Houston, Denton, Plano and Southlake. The scope of the foundation is about giving back to the community in which each attorney practices. Firm leaders began to brainstorm about how to mark the firm’s 40th anniversary, and the decision to establish a charitable foundation was unanimous. “The concept of giving back to the community emerged, and we decided to form a foundation to benefit charities all over Texas,” says Evans. as their mission statement, members of their board, normal sources of funding, who they service and how the grant money would be directed. At the same time, Vanden Eykel and Evans each put together a panel of judges to select the winners. The Dallas panel consisted of Robert Jordan, Ambassador to Saudi Arabia under President George W. Bush, Cathy Maher, former Executive Director of the Dallas Bar Association and Marcos Ronquillo, community activist in Dallas. The Houston panel featured Jeff Bagwell, former first baseman and coach of the Houston Astros, Judge David Farr of the Houston family court, who after Hurricane Harvey, got the family court system up and running again, and Chita Kraft, newscaster for CBS Channel 11, as well as Evans. Once the grant winners were selected, events were held in Dallas and Houston to honor them, as well as the other applicants. 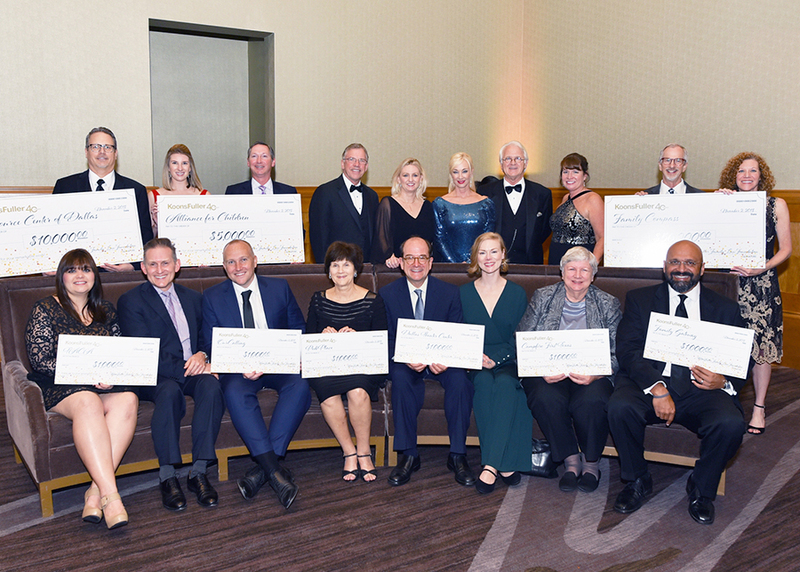 On November 2nd, friends, families, colleagues and leaders and board members from 22 non-profits gathered at the Dallas Omni for a spectacular night of wine tasting, food pairings and $100,000 in grant awards to charities serving children and families. The Dallas grand prize of $50,000 was awarded to Family Compass, an organization that specializes in child abuse prevention. “At the end of the day, our panel selected Family Compass because they determined they are in our ‘wheelhouse’ as a family law firm, dealing with children and divorce and its effects on the family,” Vanden Eykel explains. In addition to Family Compass, Dallas grantees include Resource Center, Promise House and The Family Place which each received $10,000, and Hope Supply Co. and Alliance for Children each were granted $5,000. On November 4th, those connected to eight non-profits gathered at the Houston Zoo for a day of face painting, animal demonstrations, a delicious feast in the Masihara Pavillion and $100,000 in grant awards given to charities that serve children and families. The Houston grand prize of $50,000 was awarded to Small Steps Nurturing Center, which works with at-risk pre-school children in underprivileged areas in the city. “Small Steps helps working mothers take care of children and keep them off the street,” says Evans. Along with the grant to Small Steps Nurturing Center, Houston grantees include Bo’s Place, which was awarded $20,000, as well as Casa de Esperanza de los Niños and ChildBuilders, given $10,000 each. In addition, the KoonsFuller Family Foundation also honored all 2018 grant applicants with a $1,000 donation, including Campfire First Texas, Catch Up & Read, Dallas Spark, Dallas Theater Center, Easterseals North TX, Elijah Rising, Family Gateway, Ft. Worth Public Library, Grant Halliburton Foundation, Immunization Partnership, JDRF Greater Dallas, Leukemia & Lymphoma Society, Lone Star Legal Aid, Methodist Health System Foundation, Our Calling and Trinity Basin Preparatory. In addition to the $200,000 contributed to KoonsFuller Family Law Foundation, and as of October 2018, the firm has also contributed more than $75,000 towards various non-profit organizations throughout the state. At each event the charities presented a video about what they do, which gave them the opportunity for exposure to an advantageous group of attendees. The grants, says Vanden Eykel, are not going to be a “one and done.” The firm plans to come back on a yearly basis to invigorate the charities with which they’re involved. He says he has received many thank you letters, and he assured every charity that they’d be back again. In fact, those at KoonsFuller hope to get those with whom they work, such as accounting firms, corporate attorneys and more, involved in the effort.